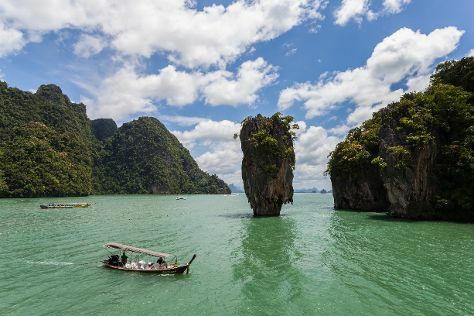 Phang Nga Province, a coastal region, features two of the most impressive dive spots in Thailand. Situated along a limestone coastline, with smaller islands out in the bays, the area hosts a coral reef that serves as a home to a diverse fish population. Rural communities in this region are largely separate from mainstream Thai society and are made up of fishing villages on the islands or on stilts in the bays. Ancient temples, hidden in the forests inland, provide good endpoints for day hikes through the jungle. Phang Nga Province is in Thailand. Use our Thailand trip itinerary builder site to arrange your visit to Phang Nga Province and any other destinations in Thailand that take your fancy.